Dr.Vijila Kennedy, Director, KCTBS holds a MBA and a PhD from Bharathiar University. Her academic career spans over 25 years and is involved in teaching, research and administration. In 2011 she took charge as the Director of KCT Business School. She has received best faculty ward for 3 consecutive years (2008 -10) for teaching and research skills. She is an active trainer and has trained over 2500 industry professionals at various levels. 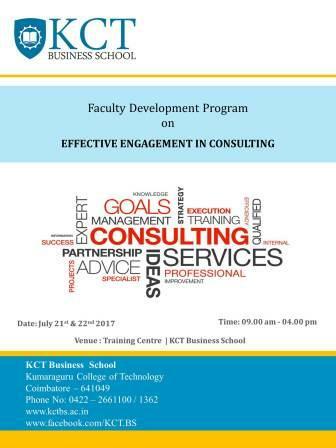 She has facilitated several Faculty and Management Development Programs. She received UKIERI funding for faculty exchange program to UK in February 2013. In 2016, she won the prestigious Fulbright Scholarship for Senior Administrators and has visited many leading Universities in the US. Vijila networks through membership in professional bodies like AMA,, ISABS,CII-Education Panel. She is also the Director of International Relations at KCT, member of the Advisory Board in the International Association of Business, Commerce and Technology Faculty, New York, USA. She has made academic visits to countries like UK, Belgium, Germany, France, Netherlands and Singapore. Prof. Swaminathan has 32 years of industry experience spanning Manufacturing, EPC and FMCG organizations both in Public Sector and MNCs in various facets of General Management, Finance and Administration in global environment. He has extensive exposure in the areas of General Management ,Managing New Venture, Project Management, Commercial Tendering and Contract Risk Assessment, Finance and Control, Customer-Vendor claims negotiations, ,Contract closures, Restructuring, Process implementation, Factory/Commercial Accounting, Internal control and Audit, Union negotiations Starting his career in BHEL as Executive Trainee, his career growth includes Divisional Finance Controller in Philips India/Lighting. He led Alstom-BF as – CFO – Alstom Power Boilers India; Finance Director – Global Manufacturing – Alstom Boilers group; Director on the Board of NTPC-Alstom Unit Managing Director Alstom – Turbomachines group India; CEO and MD – Alstom-BF. G. K. Suresh or GK as he is popularly known, has over 22 years of Corporate experience with ITC Limited. During this tenure he has spanned roles across Sales, Marketing, Supply Chain, Product Development Business Head. His last assignment was as Vice President, New Category Development with the Foods Business where he oversaw the launch of Fabelle Chocolates and Sunbean Coffee. Prior to that, he was VP- Marketing for the Foods business looking after the categories of Atta, Biscuits, Snacks, Noodles, Confectionery, Juices, Dairy and Ready to Eat. He also directly oversaw Marketing Services which encompasses Media, Research, Modern Trade, Packaging & Exports. From 2007-11 he was Head – Brands and Business Development with the Personal Care business where he oversaw the launches of Fiama Di Wills & Vivel across the categories of Soaps, Shampoos and Talcs . He is an Electrical & Electronics engineer from BITS Pilani and an MBA from FMS-Delhi. Dr.Kirupa Priyadarsini completed her PhD in HR from Bharathiar School of Management and Entrepreneurship development (2004-2007). She is a University Gold Medalist in her MBA (2000-2002) and University V rank Holder in her under graduation (1997-2000). With 15 years experience in academia, she is passionate about research and experiential learning. She is actively involved in Training and conducts workshops across Tamilnadu on psychometric tools, lateral thinking, creativity and a eminent trainer in the area of research methods and Analytical tools and techniques. She has served as program director for week long intensive Management Development Programs for MNCs. She is involved in HR Consulting Assignments with companies in areas of Competency mapping and HR Systems development. She won the UGC JRF scholarship for pursuing her doctoral degree. She has published papers and presented paper in IIM’s and IISc. Her research interest includes Studying Impact of HR on Business, Employee Learning and Development, Employee Engagement and Competency Mapping. Mr.A.Senthil Kumar is shortly to defend his Doctoral Thesis in Finance submitted to Anna University-Chennai. He has undergone a 3-month Faculty Development Programme at Indian Institute of Management (IIM)-Indore, India on Teaching Pedagogy and Research. With 15 years of experience in educating Accounting and Finance courses for the MBA programme, his research and publication interests cover Stock market Co-integration, Financial Time Series Analysis & Financial Econometrics, Portfolio Management, and Corporate Finance. He has conducted MDP & FDPs addressing the academic and industrial needs. He is a Consultant to the top management of a medium sized Coimbatore-based business group that has domestic and export business interests in manufacturing with a turnover of Rs.250 million per annum. The consultancy assignment involves designing and implementing a financial budgeting system for their manufacturing business. He is involved in the Quality Accreditation initiatives of the Business School through the NBA, NAAC and NIRF projects. Ms.Latha. A is working as faculty of Marketing Centre, KCT business school. She has 14 years of Experience in the field of academics and service sector. She has executed major consultancy assignment for one of the leading retailer in Coimbatore. she has also Co authored and published a book titled “Business Statistics Workbook using Excel” Book was published by Trinity, An Imprint of Lakshmi Publications P Ltd. The book describes the application of business statistics using excel tools. The book demonstrates the step by step process to execute the statistics in excel and also specifies the way to interpret the data. She has also organized and conducted soft skill training program for the various levels of employees at India Post and served as a resource person for the series of session organized by TANU – DABD for Agripreneurs. She has also presented research paper and case studies in various national and International conferences and won the best paper award.